England’s Olly Stone could be a fast bowler capable of terrorising the Aussies in the Ashes next year. ENGLAND have finally unearthed a fast bowler capable of terrorising the Aussies in the Ashes next year. 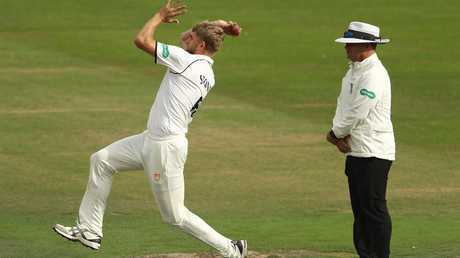 Warwickshire speedster Olly Stone, 24, has been selected in England's 16-man ODI squad to tour Sri Lanka in October. Stone is widely regarded to be the fastest bowler in the English County Championship, having been clocked at 92mph (148km/h) in a recent televised match. His selection comes after criticism of the English attack for being too slow during last summer's Ashes series. While Australia boasted a trio of pacemen capable of exceeding speeds of 140km/h, England spearheads James Anderson and Stuart Broad were significantly slower. There's a strong case to select Stone for the English test team. In the 2018 English County Championship this season he took 33 wickets at an impressive average of 11.77. 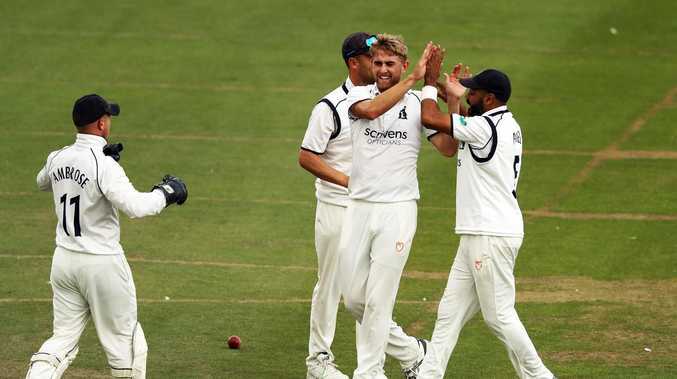 Warwickshire's director of cricket and former England Test spinner Ashley Giles labelled Stone a "Ferrari" who bowled "rockets". Giles has no doubt the paceman will flourish on the international stage. "He's ready… he'll fit into that environment," Giles said. "The bloke bowls 90mph; he gets it back in at the stumps a lot and gets people bowled a lot. "In red-ball cricket his strike rate this year is phenomenal, but I think he can play all forms. "Someone who can come on and bowl three-over bursts and look to get wickets in that mid-innings period is crucial." Stone - like many young fast bowlers - has an unfortunate history of injury. In 2016, he ruptured the anterior cruciate ligament of his right knee while celebrating the dismissal of England Test player Moeen Ali. Injury permitting, the right-arm quick could be the answer to England's third-choice paceman conundrum - multiple bowlers have been rotated in-and-out of the Test team to support Anderson and Broad, none securing the spot for longer than a series. England plays their first ODI against Sri Lanka on the 10th of October in Dambulla.